ViArt Team works hard to provide only quality products and to meet the growing needs of our clients. As a result, we want you to be happy with all our packages. 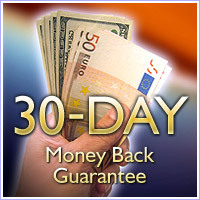 Therefore, we offer a 30-Day Money Back Guarantee for each of our products regardless the cost of the package. If for any reason you are not completely satisfied with the product you purchased from us or it just does not meet your expectations, you should notify us within 30 days from the date of the purchase and we will process your the refund. Query our FAQ database, our online manual and our flash manuals. You might be able to find an answer that helps you better use the product to your satisfaction. Visit our Forum. Perhaps others have been in the same situation and you might find a solution there that works for you as well. Moreover, our support team provides answers to many forum questions. A request to cancel Installation service order is to be submitted before our specialists start the installation procedure on your server. Moneyback does not apply if our specialist has already started or has completed the installation procedure. We do not refund money for any kind of custom work or design. Once the money is paid our specialists start working on the project. When they complete the development or design and there is something you don't like, you can request the modifications to be made to meet all your needs. Please, note that we do not refund money for any of our hosting plans if you submit payment for one month only. However, if you subscribe to our yearly hosting plan and would like to stop using our services for any reason before expiration of the term, please notify us and we will refund you the money for the period left. For security reasons the credit card you use to purchase any of ViArt Products must be valid when you request a refund. We cannot refund to a credit card that has expired or been cancelled. For money transferred to us via Bank Wire Transfer we will only refund money to your Paypal account. Your PayPal account must be considered "Verified" by PayPal, open, and in good standing with PayPal for us to refund money. Please note: we will deduct the transaction costs for the Wire Transfer if they were not paid by you when purchasing the ViArt product. A request for a refund must be submitted using a standard support request. Requests directed to other contact addresses or phone calls are not accepted for cancellation. Please notice that on receiving moneyback you are obligated to remove the software and all related files from your web-server and every data medium; your further use of the software will be regarded as illegal unless you obtain a license again. We also believe that most of moneybacks can be avoided. Please contact our qualified staff and you will get a professional assistance in any technical issue you have faced with while installing/configuring the software. If you are not happy with our products or services for any reason, you are always welcome to send us your feedback and suggestions on how to improve the software or services we offer. We will do the best we can to ensure you are totally satisfied with our software and customer service.